Lucy and Marilyn on the red carpet! Lucy helps with a mother's touch. 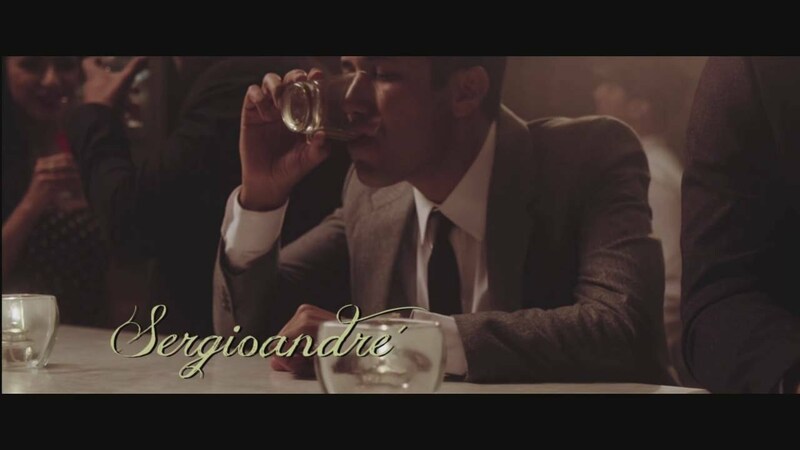 Amber as Lucy in Sergio Andre's music video for "Me Quedo Contigo". 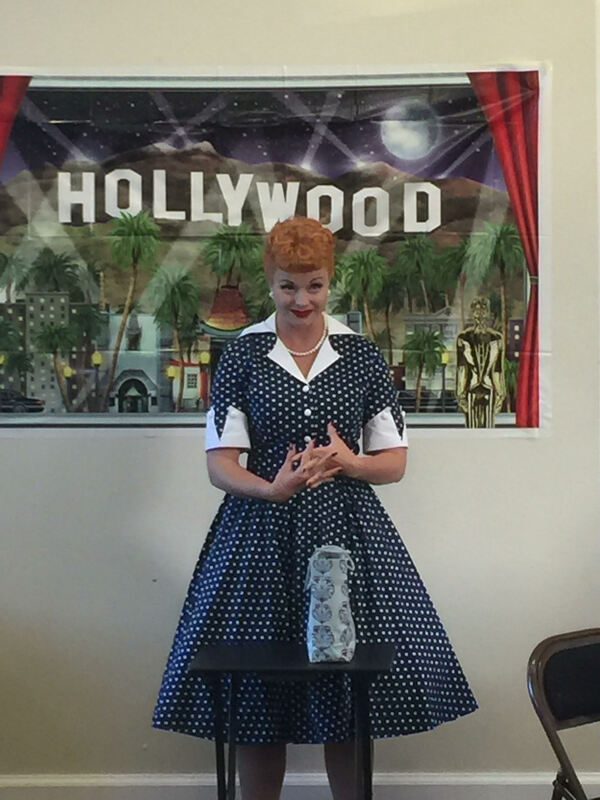 As one of only 2 actresses on the West Coast approved by Desilu Too and Lucille Ball's family to portray Ms. Ball, you can be sure you are hiring an authentic Lucy for your event. 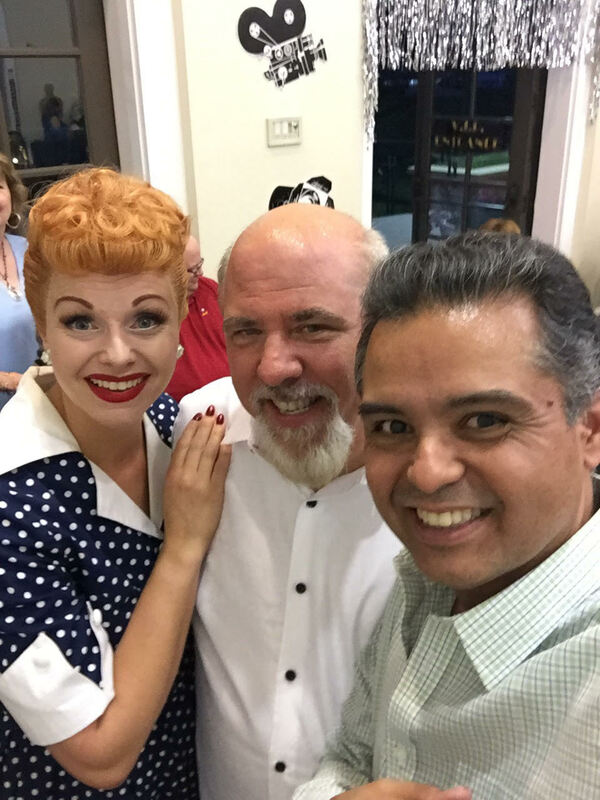 From her spot-on mannerisms and voice paired with her her uncanny ability to transform herself, Amber is truly a dead ringer for the Queen Of Comedy, Lucille Ball. 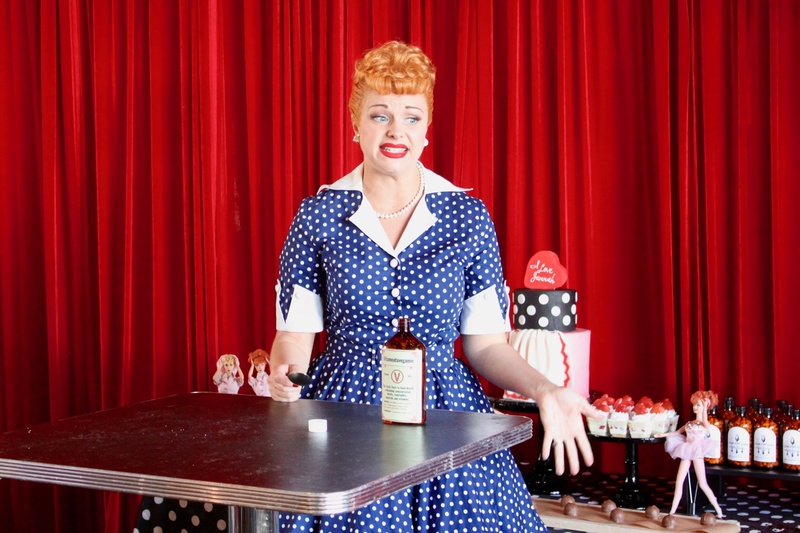 Her high energy antics and her ability to embody Lucy from head to toe will leave your guests truly believing that they just rubbed elbows with the world's most beloved red-head. 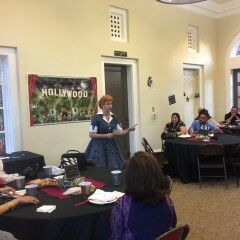 Amber also appears as Miss Poppins, Hedy Lamarr, and Wonder Woman, in addition to being a talented VO artist and singer! Check out her videos and sound bites for a taste! Amber is the real thing! I am the Catering & Sales Director at a beautiful winery in Temecula, Ca. ; we host a Grape Stomp event every year for our wine club members. I can honestly say that I found my Lucy for ALL of our Stomp events. She arrived on time, was a PLEASURE to work with and was very accommodating with my requests. She went above and beyond to make sure that all our guests were entertained and having a great time. I would recommend Amber to anyone that is looking to WOW their guests! Can't wait to work with her again! Yesika, you and your entire staff were such a pleasure to work with! I am so glad that you were pleased with my performance, because I had such an amazing time at your event! Thanks again, and I can't wait until next time! 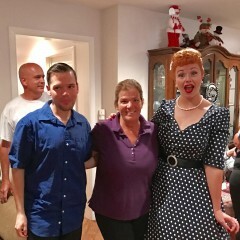 I cannot tell you how impressed I was with Amber's performance at my Sister's 60th birthday party. All of our friends and family thought she was fantastic, and couldn't believe that I had found such a true to life Lucy! Thank you Amber so much for not only being a wonderful performer, but such an amazing person full of generosity and kindness. I thank you from the bottom of my heart for joining our celebration of my sister, and hopefully in 10 years your can join us for her next big birthday! Gloria, I was honored to be chosen as the performer for your sister's party. You and your family were so fun and welcoming, and I truly enjoyed myself! She was awesome and people are still talking about her!! 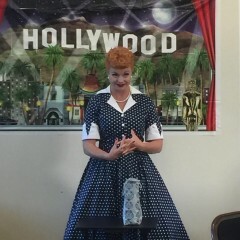 We hired Amber (Lucy) to appear at my partner's 60th Birthday Party as a surprise, and my partner and all attendees were impressed with her performance and resemblance to Lucy! She worked the room, and she was very accommodating to have everyone take a picture with her afterwards. She added value to the party and made everyone laugh! I am very glad I hired her! She did not disappoint; people are still talking about her! On a personal note, she was very pleasant to deal with and she was very accommodating in making her appearance personal to the birthday "boy". She asked questions ahead of time, so she could relate to him. 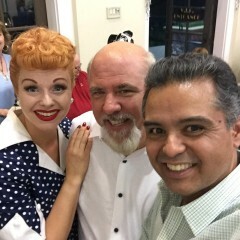 My partner is a big Lucy fan, and she made her performance related to him, but she was an absolute joy to have her join the party! We loved our Vitameatavegamin Girl! Amber was energetic and a pleasure to work with. 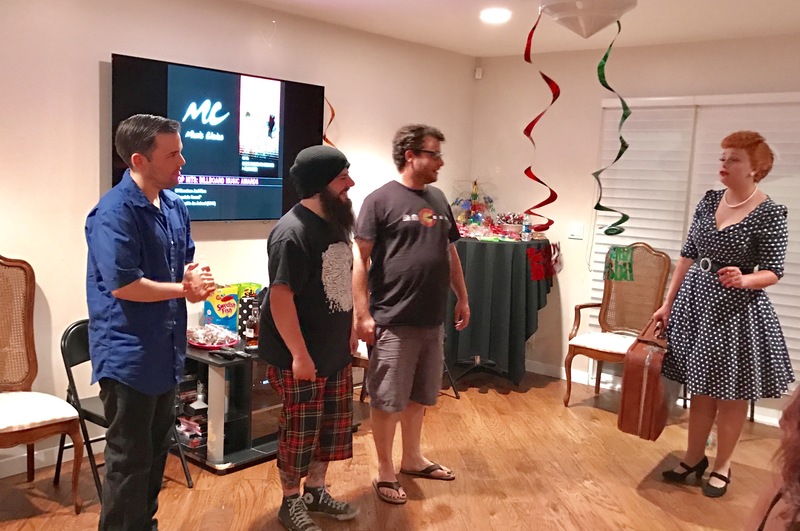 She WAS the party: keeping everyone (young and old) engaged and entertained. She arrived ahead of schedule and even stayed a little late. Everyone LOVED her and I would highly recommend using her for an event. 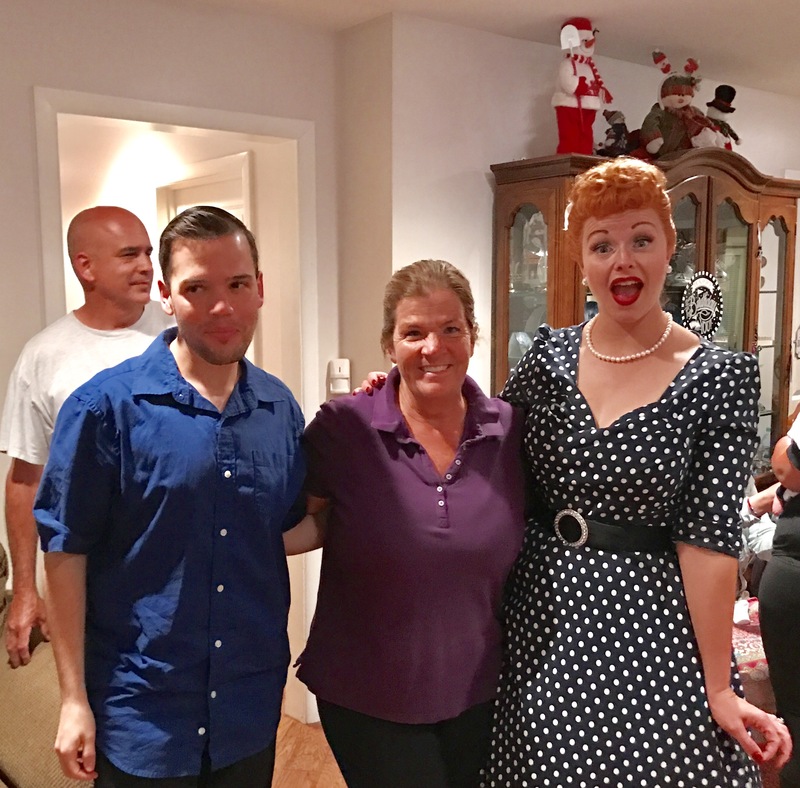 We hired Amber (Lucy) to show up at a surprise birthday party we were having for a huge Lucy fan and Amber did not disappoint! 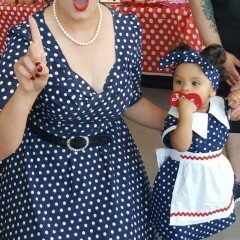 Our guest list included young and old, straight laced and punk rockers and Amber/Lucy won them all over! 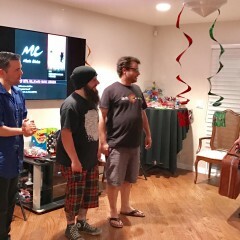 From her solo performance of the hilarious Vetavitavegeman skit, to the interactive acting scene she put together for our birthday boys, Lucy was amazing. 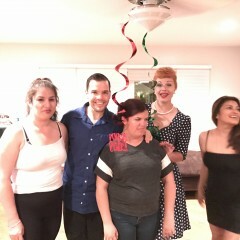 She never broke character and mingled with all of our party guests up until the very end of the night. We all had a great time and having Amber/Lucy there only made the night so much more memorable! We will definitely be booking her for future events. Thank you again for everything Amber/Lucy!! I can't even put into words how magnificent Amber was as Lucy! 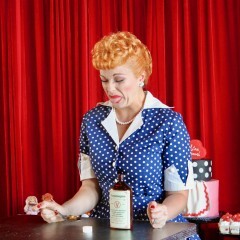 She is truly an artist, embodies Lucy's spirit and spunky attitude! 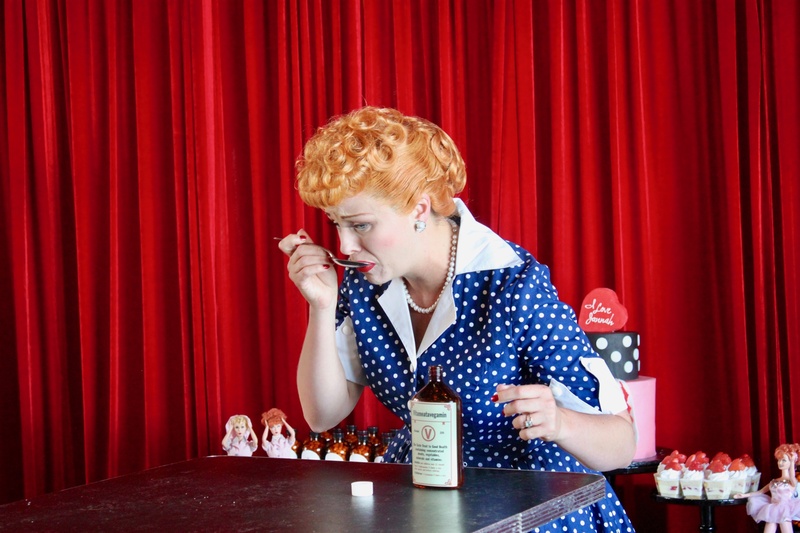 Her Vitameatavegamin bit was spot-on, it was like we were watching Lucy Ricardo in real life. She was prompt, professional, and her make-up, costume and iconic hair was perfection. I would highly recommend hiring Amber for any party you are planning, she was "Epic" in the words of my 6 year old. Emily, thank you so much for your kind words. It is so nice to be recognized as an artist, and your comments are so appreciated! Your friends and family were such a delight to be around, and you were such a gracious host! Thank you for having me, and hopefully we can work together again! 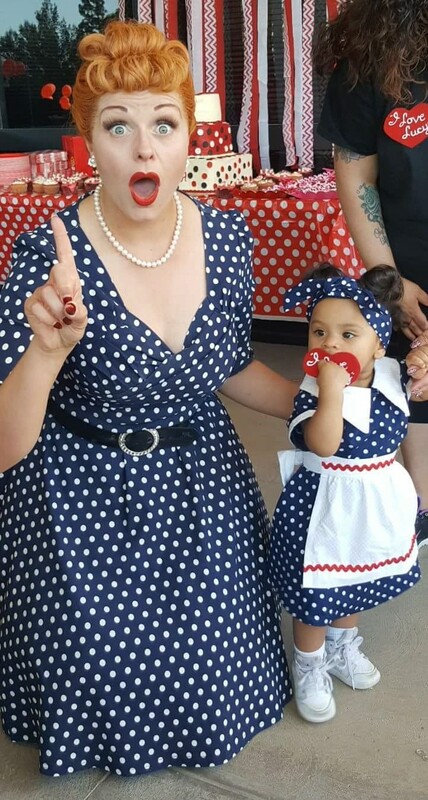 We hired Amber to be our special guest at our daughter's 1 year old birthday party (yes the Lucy Fan is mom LOL) and we cannot express how amazed we were by Amber! Our friends and family were star struck as were Mom and Dad (baby girl was excited too)! Not only did she stay in character, the resemblance was insane! The whole crowd was so entertained and needless to say we had everyone asking "Where did you find her?!" and of course we shared our secret of GigSalad. I almost want to have another party just to see Amber again! She was a doll and we are glad we got to know her too! Thank you so much for making our party so unforgettable! Maribel, I cannot thank you enough for inviting me to be a part of your daughter's special day! The party was amazing, and I am so glad that I got to know such a delightful and loving family! Happy Birthday little Lucy! Thank you Richa! 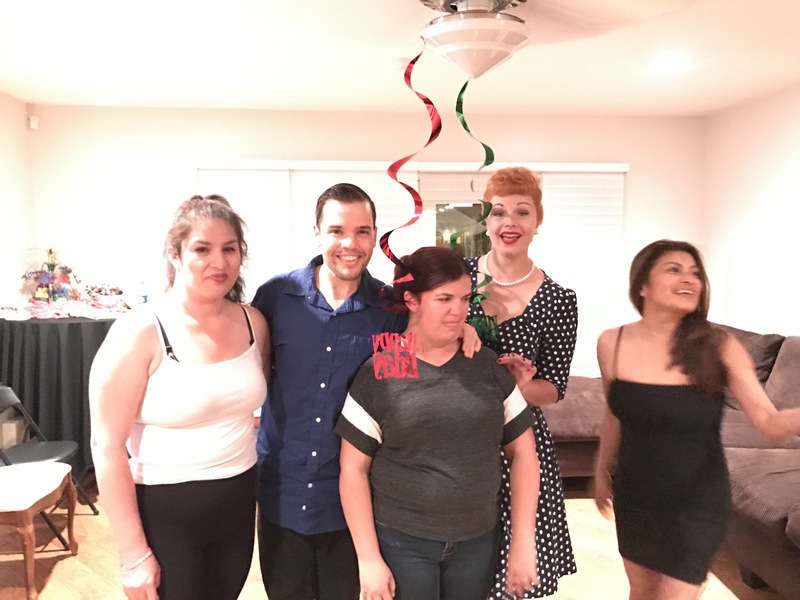 You threw such a thoughtful party, and I was thrilled to be a part of it! 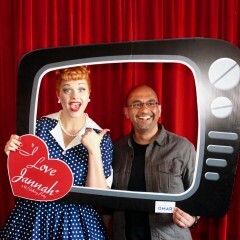 Amber is an amazing talent resembling Lucille Ball. She had great enthusiasm, grace, and confidence! 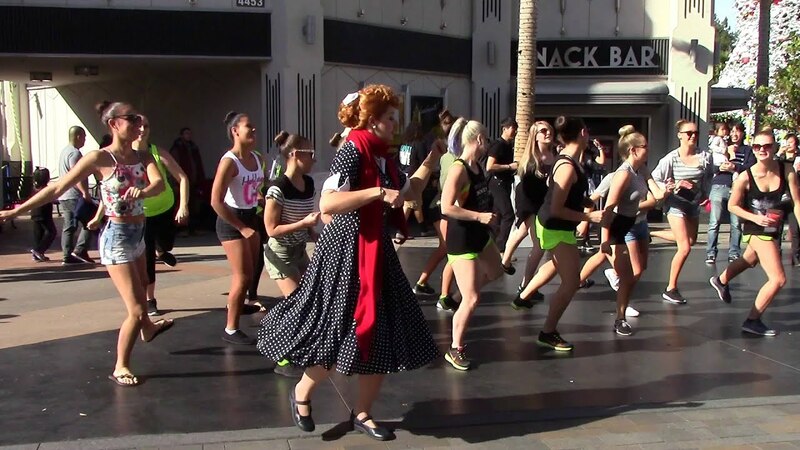 She mingled with guests, took pictures, danced, and stayed in character throughout our whole event. 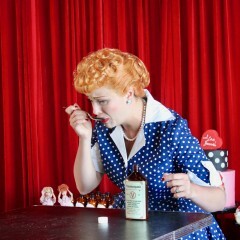 If you are looking for a Lucille Ball look-alike or classic entertainment, Amber is the perfect person for you! For all future events, I will contact Amber. She is a pleasure to meet! Book her today! Kimberly, I had such a blast at your event, and you were such a lovely and professional person to work with. Congrats on a wonderful event! Amber (Lucy) was the highlight of our event! Her striking resemble to Lucy was uncanny. Her Lucy facial expressions and performance made us all feel like Lucy was really in the room. Thank you Amber...thank you GigSalad!!! Thank you Kimberly for inviting me to your event! I had such a great time, and enjoyed the conversations I had with everyone. It was a real treat for me! Price Range: Please contact for a quote. 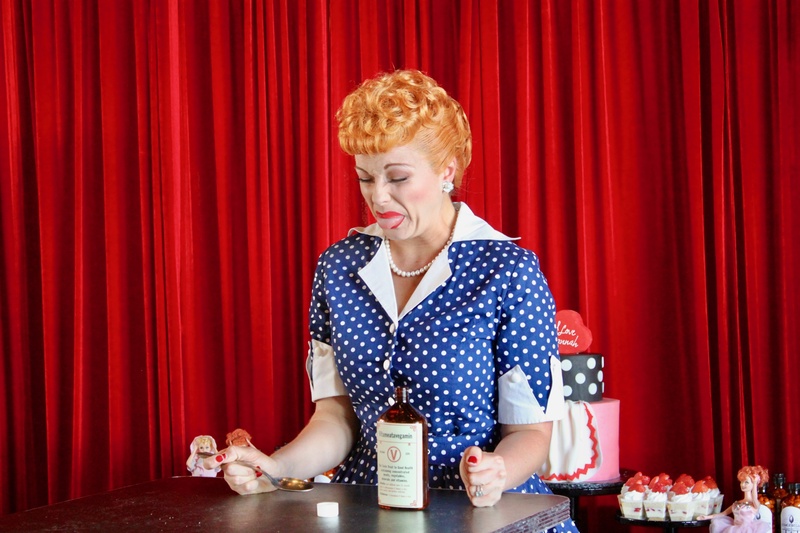 From her hilarious performance of the beloved "Vitameatavegamin" episode, to a full blown grape stomp festival, Amber has brought the sentimental joy of Lucy to fans the world over. Amber takes pride in working with clients to make sure that every detail of her appearance and performance is tailored especially for their event, and that the guest of honor gets the special treatment they deserve. 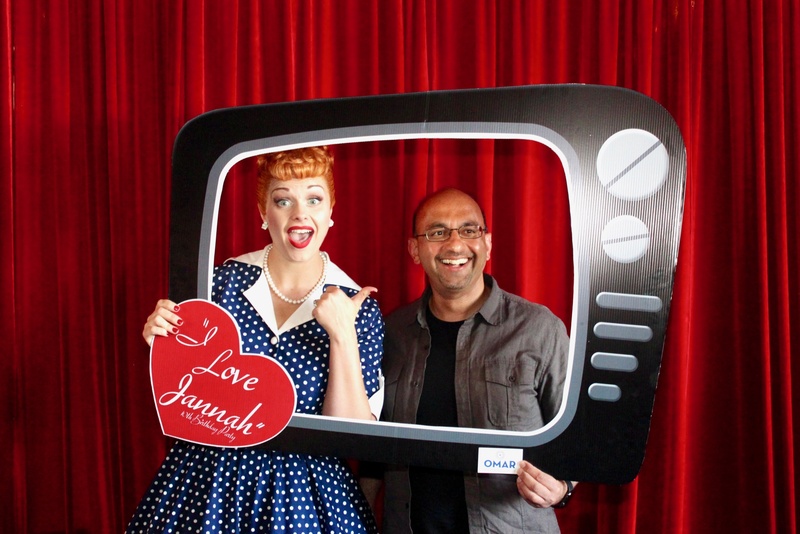 Don't hire a cheap imitation; invite Amber to your event and leave your guests wowed with the most Authentic Lucy out there! Amber is also a seasoned singer, actress, and voiceover artist, and brings the magic of Miss Poppins and Wonder Woman to parties as well! Check out her videos and photos for more! Amber is a Southern California girl with a passion for bringing memorable characters to life. 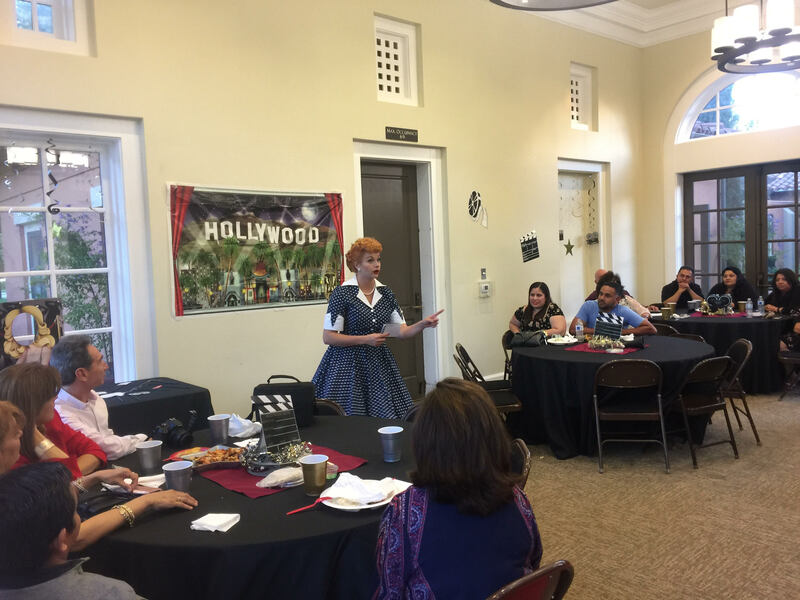 She has performed for the past 13 years at all of Southern Californias top 3 theme parks, creating memorable interactions with guests from all over the world. If performing on stage, a handheld or headset microphone must be provided, along with lighting to suit the wanted visibility of the performance. If traveling outside of the Los Angeles area, a mileage fee will be added to the price quote. If overnight hotel or flight accommodations are required, they will be paid for by the client. If travel exceeds the day of the event, a travel day fee will apply. Please note that rates vary for type of performance requested. Sound system with microphone, if required for performance.